As TDs and Senators return to Leinster House tomorrow they’ll be looking at just how many calories they’re consuming. AS TDS AND SENATORS return to Leinster House tomorrow they may be in for a surprise when they look at the menus in the various Dáil catering facilities which will display calorie counts for each dish. The initiative is one developed by the Health Minister James Reilly who is hoping that all restaurants, bars and cafes in the country will eventually display calorie counts for each dish on their menus. 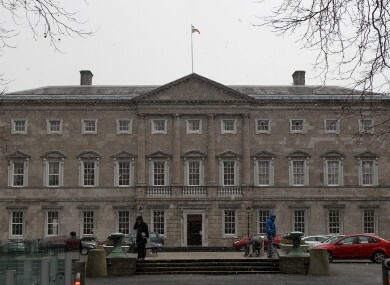 The implementation of calorie counts on menus in Leinster House was first announced in April with it now expected that all catering outlets in Leinster House will display menus with calorie counts. “This will act as a real incentive for those who are trying to lose weight or who simply want to keep an eye on what they are consuming,” the Oireachtas Health Committee chairman Jerry Buttimer said today. He said it is “no secret that the life of a public representative can lead to unhealthy dietary choices which lead to unwanted weight gain”. Buttimer added: “This move to include calorie counts on menus will help those who are using the Dáil restaurant to be more mindful of what they are eating and the impact the decisions they are making are having on their health. The Fine Gael TD said that obesity in Ireland has “reached crisis levels” pointing to statistics which show 61 per cent of Irish adults are now thought to be overweight with more than a quarter of children said to be either overweight or obese. Email “TDs and Senators will be able to count their calories when they return tomorrow ”. Feedback on “TDs and Senators will be able to count their calories when they return tomorrow ”.